Located in the Des Moines River Valley Estherville is the home to approximately 6,500 people. A place where small town friendly charm is still abundant and everyone knows your name. Only a 15 minute drive from Estherville you will find a beautiful chain of glacier carved lakes that includes Iowa’s largest natural lake, Spirit Lake, and five interconnected lakes that include the Okobojis. Estherville has lots to see and do! We are located on the beautiful West Fork of the Des Moines River. This river is great for spending time outdoors. It offers wonderful fishing, canoeing, kayaking and floating. We have an indoor wellness Center that offers full olympic style pool, slides, childrens shallow water play area and a zero depth play area for small children. It also includes two full sized gymnasiums, an indoor walking track and fitness center. Fort Defiance State Park is a beautiful place for a picnic or a hike or even a ride on your horse. There is so much fun to be had, both indoors and out! Try swimming, roller skating, the movies, bowling, golf, wine tasting, hiking, boating and more! A 455 pound meteorite fell just north of Estherville on May 10, 1879? It is one of only six observed falls. There are pieces on display at the Estherville Public Library and inside the soon to open Meterorite Center in Estherville! 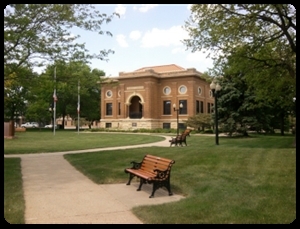 The Emmet County Historical Museum is located at 1720 3rd Avenue South in Estherville, and it's open 2-5pm during the months of June, July and August. The museum features a number of historical buildings and exhibits showing off the area's rich history. Estherville hosts a farmers market during the summer season and offers free live music during that event each week. Very little public transportation but we do have a small public airport and the Rides Bus which offers rides but requires a call ahead. Avera Holy Family Hospital is the chief provider of healthcare in Estherville. They offer a wide range of specialty services and is linked to regionally recognized physician specialist and advanced technology through Avera McKennan Hospital and University Health Center and Avera Health. Physician Specialty Care in Estherville includes Cardiology/Heart Specialist, Dermatology, Family Medicine, General Surgery, Infectious Disease, Nephrology/Kidney Specialist, OB/GYN/Women’s Health, Oncology/Cancer Specialist, Chemotherapy, Ophthalmology/Eye Specialist, Orthopedics/Bone & Joint Specialist, Otoloaryngology/Ear, Nose, Throat, Pathology/Tissue Analysis, Pediatric Pulmonology, Pediatrics, Podiatry/Foot & Ankle Specialist, Pulmonology/Lung Specialist, Radiology/Diagnostic Imaging Specialist, and Urology/Urinary Tract Specialist. Jan 6.0 F° 15.5 F° 25.0 F° 0.7 "
Feb 11.0 F° 20.5 F° 30.0 F° 0.5 "
Mar 22.0 F° 31.5 F° 41.0 F° 1.6 "
Apr 34.0 F° 46.0 F° 58.0 F° 3.3 "
May 46.0 F° 58.0 F° 70.0 F° 3.8 "
Jun 56.0 F° 67.5 F° 79.0 F° 4.5 "
Jul 60.0 F° 71.5 F° 83.0 F° 4.1 "
Aug 58.0 F° 69.0 F° 80.0 F° 4.0 "
Sep 48.0 F° 60.5 F° 73.0 F° 3.2 "
Oct 36.0 F° 48.5 F° 61.0 F° 2.3 "
Nov 23.0 F° 33.0 F° 43.0 F° 1.6 "
Dec 10.0 F° 19.0 F° 28.0 F° 0.9 "
Spring temperatures are cold with averages in the mid 40's and highs in the mid 50's. Nights are cold with lows in the low 30's. Summer temperatures are mild with averages in the upper 60's and highs in the low 80's. Nights are cool with lows in the upper 50's. Fall temperatures are cold with averages in the upper 40's and highs in the upper 50's. Nights are cold with lows in the mid 30's. Winter temperatures are cold with averages in the upper 10's and highs in the upper 20's. Nights are cold with lows in the upper 0's. Condos Over 50 Communities Estherville has a variety of affordable housing options. If you’re interested in buying a home, our realtors would be delighted to assist you. Houses range in price from $30,000 to more than $200,000. If you’d prefer to build a new home, there are housing grants available! We also have an assisted living community that offers apartment style living with many amenities. We have RSVP which is an organization for people over 55 to volunteer in the community.